I have been away from the blog for awhile as the business of work, summer gardening and general activity took precedence. Now it is September and in our area September means fresh apples from the many local orchards. I love the smell of apples baking and am always looking for a new baked good using apples. 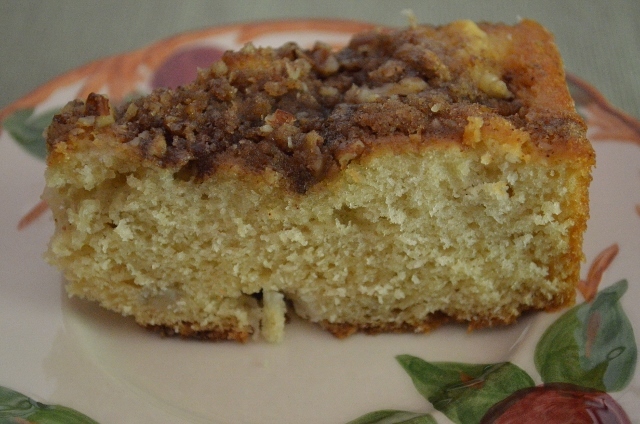 Although this is called a coffeecake, it is great as a dessert or snack. Another bonus is that recipe makes two 8 inch cakes so you can eat one now and freeze the other for later or give as a gift. Enjoy! 1. In a mixing bowl, cream shortening and sugar. Add eggs and vanilla; mix well. 2. Combine flour, baking powder, baking soda and salt; add to the creamed mixture alternately with sour cream. Stir in apples. 3. Transfer into two greased 8-inch square baking pans. 4. For the topping, combine brown sugar and cinnamon. Cut in butter until crumbly. Sir in nuts; sprinkle over batter. 5. Bake at 350 for 30-35 minutes or until a toothpick inserted near the center comes out clean. Mary this looks great!! Fall coming in makes me want to bake up something with apples and this looks perfect! thanks.